First off, I am an audio idiot. I am in the process of replacing speakers that I bought in the mid-90's. Therefore, I will apologize in advance if this all just sounds stupid to those of you who are experts in this area. Ok, so I connected my receiver to the top set of posts, which sit alone. Now the sound comes out of the top of the speakers (the elevated one that lies on something like a 45 degree angle). However, shouldn't the front of the speakers be putting out sound as well? Or is that only for bi-amping? Should I be hooking up additional wires from the receiver to these other posts? Compared to my vintage 1996 speakers, this sounds pretty great, even without the rear speakers in place yet. But I have a feeling I'm doing this wrong and would like to get the most out of these. Support is closed until Tuesday, so I'm hoping someone can give me some advice. The terminals you are using are just for that top ATMOS channel, not the main drivers themselves. You need to run that to the Height channel on your AVR, and run the second or third (either or, doesn't matter - you don't need both) to the main channels on the AVR. Oh that's great - thanks so much! So you only need both of the bottom ones for "bi-amping"? If you don't mind one more question...on the back of the receiver there is "Front" and "Front Presence" connections. Do you think Front Presence is what you are referring to as the height channel? And Front would then go to the main drivers? So you only need both of the bottom ones for "bi-amping"? Put the bi-amping thought out of your mind. AFAIC dual-binding posts on speakers at this level are just a marketing gimmick. 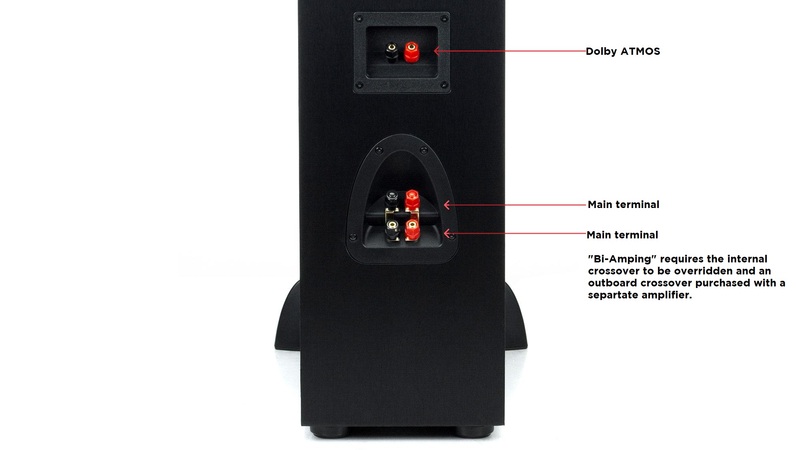 Bi-Amping requires some minor internal modification to the speakers, and additional components to accomplish. Incidentally, I recommend using one post at the top, and one post at the bottom - that way if the strap comes loose, you'll know that there's an issue - rather than running with a high or low and not realizing it. Doesn't matter if you do red or black, just do one red and one black. You are correct. Front is main, and presence is height. I just got a pair of R-26FA's for Christmas. Each Speaker needs 4 wires. Red/Black front on lower terminals, and Red/Black on (Extra SP1) F. Presence / Zone 2 (as labeled from your Yamaha RX-V683 manual on line. I bought some banana plugs at Best Buy and put them on either end of the speaker wires. You have to remove the little plug on speaker to use them. It makes disconnecting either end much quicker.